The Sunday Funnys feature is usually reserved for my son Jake and the weird things he does. Recently my dog Winston did something so funny that it begged to be featured in this week’s post. For my new readers, this is my Golden Retriever Winston. You can read more about him in one of my favorite posts called It’s Tough to be the Dog. 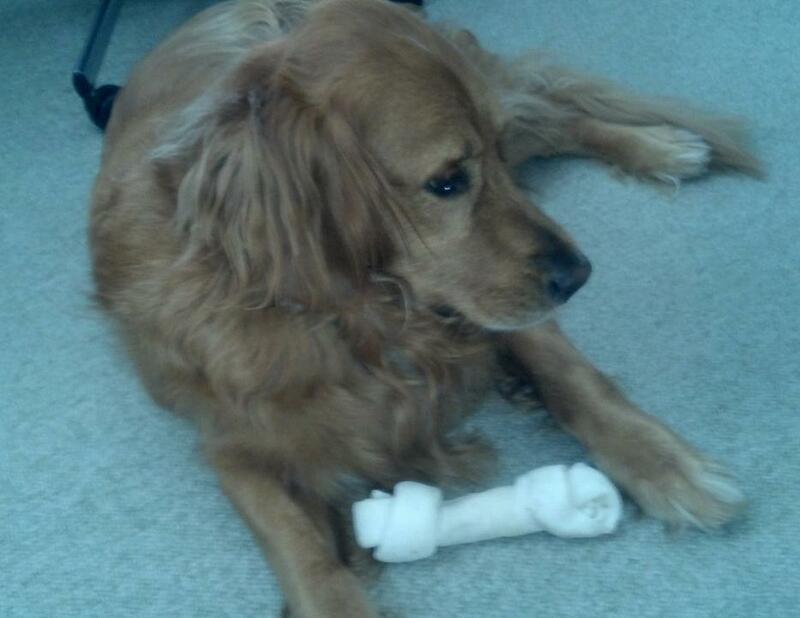 Recently, Boyfriend Ben gave Winston a present of one of those big rawhide bones. He was so excited. He actually tossed it up in the air like a ball. My other Golden Woodrow, would have eaten that thing in an hour but not Winston. He treasured that rawhide bone like it was best thing he’d ever seen in the world. I swear I saw Winston smile the whole day. He kept that bone by his side all day and slept with it beside him that night. I don’t think he’s realized the truth behind the bone – it’s not a toy, you’re suppose to chew on this and eat it you silly dog. Day 2: Is this a teddy bear? Winston carried the bone around the house with him like it was a teddy bear. At one point in the day, he accidentally left it upstairs. 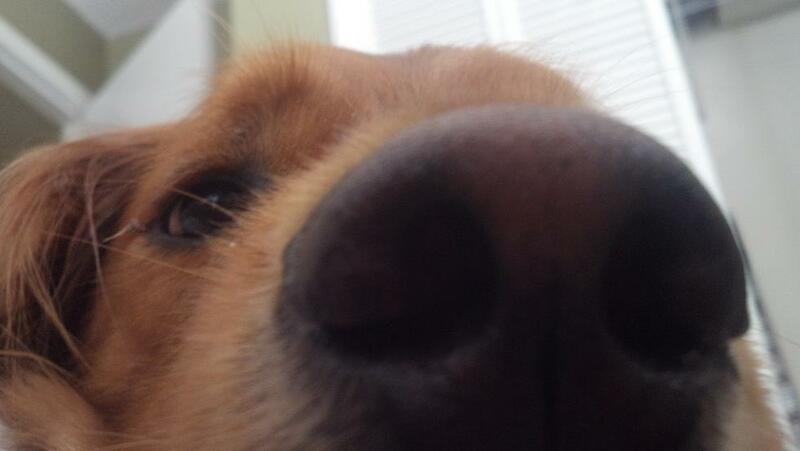 I asked him, “Where’s your bone Winston? Go get your bone.” He took a quick spin around downstairs and I heard him take the stairs two at a time. He came bounding back down with that dog smile … and his bone. We’re now going on Day 3 and he still hasn’t realized that he can eat the thing. He spent the last two nights with the bone by his side. One paw over it, protecting it like his favorite cuddly toy. Today I woke up to hear an odd noise coming from Winston. Normally he makes this huffing noise when its time to get up but today, it sounded more like a hrumping sound. I look over to see his fur face on the edge of the bed. His usual huffing noise has changed due to the fact that he now has the bone in his mouth. There he was, trying to smile with a large bone in his mouth … and good morning to you too. The rawhide has now become a part of our house. Winston has grown attached to the bone and continues to take naps with it and carry it around the house with him. It has become the favorite toy – we play fetch, tug of war and yep, it’s the center of the game of “where’s your bone Winston?” that we play every night. We no longer wonder why he won’t chew it or eat it. Jake and I talk about what we should name his rawhide so we can teach him to go get it when we call for it. By this point, we’re convinced that Winston has somehow gotten some of the weirdness genes that rotate between Jake and myself. There must be something in the house that has now affected us all – me, my son and now Winston. Winston has had a good week of being Winston. He usually gets what we call Good Boy Treats (dog biscuits) every night but on the weekends, he’ll get a special Good Boy Treat of a small rawhide bone with some beef flavoring on it. That night after he’s eaten his Good Boy Treat, he starts to sniffs his rawhide toy. Fifteen minutes later, I hear a loud noise coming from the kitchen. I find Winston on the floor just going to town on his precious bone. By the time I get into the kitchen, he’s already eaten 1/4 of the bone. Eating his Good Boy Treat must have triggered something to remind him what he’s suppose to do with a rawhide treat. The love affair with the rawhide is over. The chewing has started and continues over the next two days (I had to take it away that first night or he would have gotten sick). And for that brief moment, Winston acts like a normal dog who knows what to do when he sees a rawhide bone. Hahahhahahaha. That’s funny! I just love dogs and their quirks! I know … some days its so hard to be Winston. Do you ever want to be a dog? They are made happy so easily. Good for Winston. Score for Ben. I’ve always said thatvwhen I come back, I’m going to be a golden retriever. How hard could it be to live your life as a cute dog? Did you ever read the book A Dog’s Purpose by W. Bruce Cameron? I haven’t read the book but it sounds like one I’ll put on my reading list. And great post (how did I miss that?) But I can’t side with your wife. I think that you guys should get a dog, there’s nothing more heart-warming than to see a boy with his dog. I usually take care of Winston more but that’s just part of having a dog. I think I have come to the realization that I would be a better grandparent to a dog. I like them, enjoy spending time with them, but also like that they visit and then go home. Now that I understand! Dogs can be a lot of work if you’re not use it. So are you saying that when your family comes down to Orlando, that you’re NOT going to dog-sit for me????? Well, you see. Hmm. How do say this? Never wanted to be a dog…a cat sometimes….everybody (me and the retrievers) need reminders now and then. Maybe he’s a MODERN PHILOSOPHER…in disguise!!!! I have questioned who he was in his former life. There are times when he seems way beyond his years. Aw Winston! He definitely looks like a good cuddler!